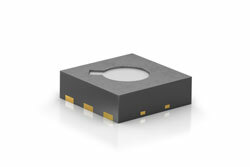 Sensirion, the expert in environmental sensing, now offers the ultra-lower power gas sensor SGPC3. The SGPC3 makes indoor air quality sensing available for mobile and battery-driven applications. With an average supply current of less than 0.07 mA the SGPC3 is able to provide indoor air quality measurements with several years of battery lifetime. Based on Sensirion’s SGP multi-pixel platform the SGPC3 offers a complete gas sensor system integrated into a very small 2.45 x 2.45 x 0.9 mm3 DFN package featuring I2C interface and a fully calibrated and humidity-compensated air quality output signal. Sensirion’s MOXSens® Technology provides the SGPC3 with an unmatched robustness against contamination by siloxanes resulting in outstanding long-term stability and accuracy. The combination of ultra-low power consumption and long-term stability makes the SGPC3 the perfect choice for indoor air quality monitoring in mobile and battery-driven smart home applications. Evaluation and testing is supported by application notes and example code; the SGP evaluation kits are also available through Sensirion’s distribution network. Visit Sensirion’s website to see where you can order the SGPC3 gas sensor or to learn more about its specifications and features: www.sensirion.com/sgp. Discover more about the most relevant environmental parameters and Sensirion’s other innovative environmental sensor solutions at www.sensirion.com/environmental-sensing.